It's time to take a STAND Kentucky and Tennessee. 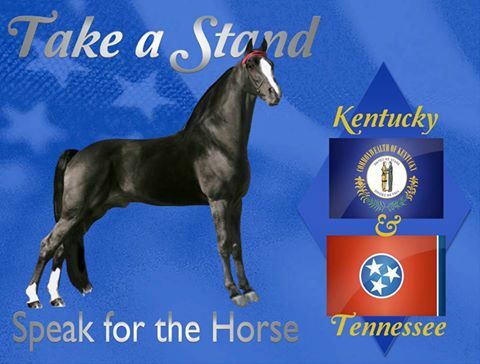 The American Horse Council supports an initiative to contact your senators and LET THEM KNOW that the Tennessee Walking Horse Breed must change and evolve in order to survive. The only way that can happen is to pass the PAST Act. The American Horse Council has provided a link to use that will make this process easy. Your information is safe and you will not be solicited. Please fill out the form and share ! The USDA/APHIS is proposing a rule change that would closely mirror what The PAST Act would do to protect our horses. Congress moves slowly, but this rule change can be enacted much quicker! Currently, they have opened a portal online for We The People to make comments on this rule. It is safe to say that they all know what “soring” is, so commenters don’t need to use up words and valuable space going into detail explaining soring. Certainly people may offer their personal opinion about soring. Below are some talking points to use as inspiration for your comments. • “Soring” has led to the decline of our breed, the Tennessee Walking Horse. • Tremendous losses have occurred economically due to the unethical treatment of these animals/horses. • The ambivalence of key people in the breed industry about soring has a huge negative impact on normal growth for owners and breeders. • The stigma and negative effects of the Big Lick are widely seen as abusive in the equestrian world. • The Walking Horse breed has not been a member or recognized by the United States Equestrian Federation (USEF) for decades because of the failure by the breed association to structure rules and penalties for soring from within the organization. They have instead found a way to operate comfortably working the loopholes within the HPA. • The result is division and disassociation by the equestrian world from the Walking Horse owners who practice ethical training. • The entire industry is painted with a broad brush of negativity costing careers and livelihoods for the flatshod natural trainers, instructors and enthusiasts. • Self-regulation has not and is not working to end the practice of “soring”. • HIO systems are not all accurate or above board. Rules are enforced differently and there is no consistency. For best results, use desk top or laptop to leave your comment. NOW! ! ARE YOU READY ? CLICK HERE AND GO LEAVE YOUR COMMENT ! Are you a former member of TWHBEA ? After you vote "Yes" or "No" please click Other and add a reason.